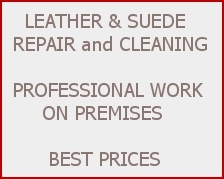 Ottawa Leather Jackets -- "The finest leather garment store in Ottawa since 1973." 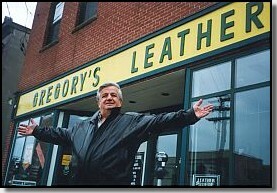 Gregory's Leather is having a Store-Wide Clearance Sale ! Large inventory of jackets, vests, coats, and accessories on sale now ! 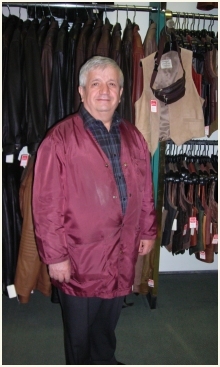 The large airy store features walls lined with coats, jackets, vests, skirts, slacks and a proprietor who takes pride in his friendly dealings with customers. Gregory's stock is diverse in colours and styles but share one thing in common - they're almost all made in Canada ( if not in his own shop ). There are few imported pieces. "Everybody sells imports" he says. "I live in Canada and I like to sell Canadian products." He also carries leather pants, blazers, vests, skirts, chaps, purses, sheepskin mitts, and gloves. Even with a selection of over 1000 pieces, if you are unable to find the style of item you would like, Gregory will design one just for you. He will sit down with you and discuss what it is you want, take your measurements and design the garment that's perfect for you according to your specifications. Drop in and tell us what you are looking for. Serving Ottawa since 1973, Gregory's leather fashions takes pride in satisfying each customer with the best possible quality in leather coats, jackets, vests and more. Gregory's Location : 458 Rideau St.